GO Group @ Exit Festival – we will be back! Greener, smarter, more sustainable – the GO Group credo is becoming more and more important to the European events industry. Festivals from all over the continent take part in the process and we really want to see all the others follow. EXIT Festival and GO Group announced the first „GO Group Workshop for eastern European Festivals“ taking place during this year’s EXIT Festival. We met 20 delegates at this interactive, open and communicative workshop format to stimulate exchange, cooperation and inspiration – between event organizers, suppliers and all other parties involved in an event’s orginazation. We were lucky to get a wonderful room in the “Titovi Apartmani” at the Fourtress of Novi Sad – right where the festival takes place and started out in best mood and athmosphereon July 11 and 12 2013. 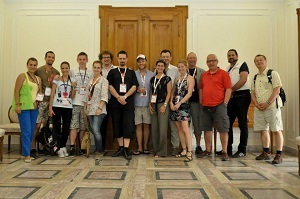 The GO Group Workshop for eastern European festivals provided a wider view on sustainable event management, case studies from major European festivals (f.e. Glastonbury, Sziget and Rock For People) and initiatives (such as A Greener Festival, Green Music Initiative and GreenEvents Europe), best practise examples and more. Program: (subject to change) The workshop language was English.